One of my favourite treats in the summer is fresh mozzarella, basil and sun ripened cherry tomatoes together. Yum! Fresh mozzarella is also quite expensive, which makes it a real treat food. 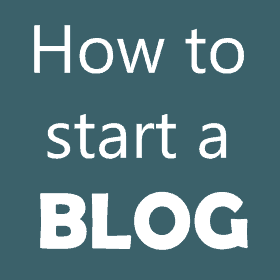 But, as I discovered a few years back, it is very easy to make! 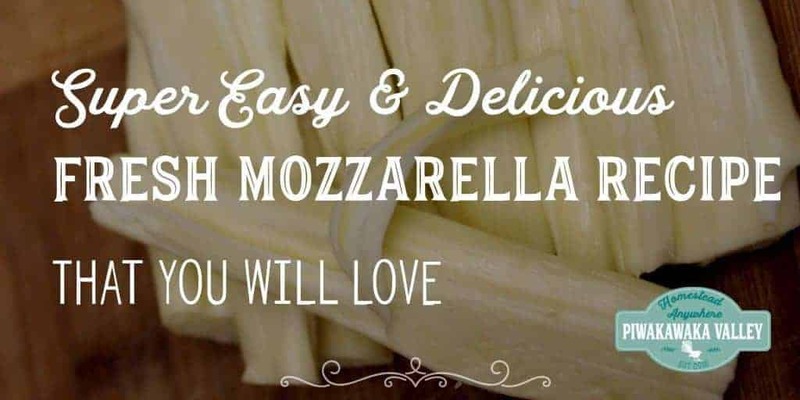 So I thought I would share my fresh mozzarella recipe with you! 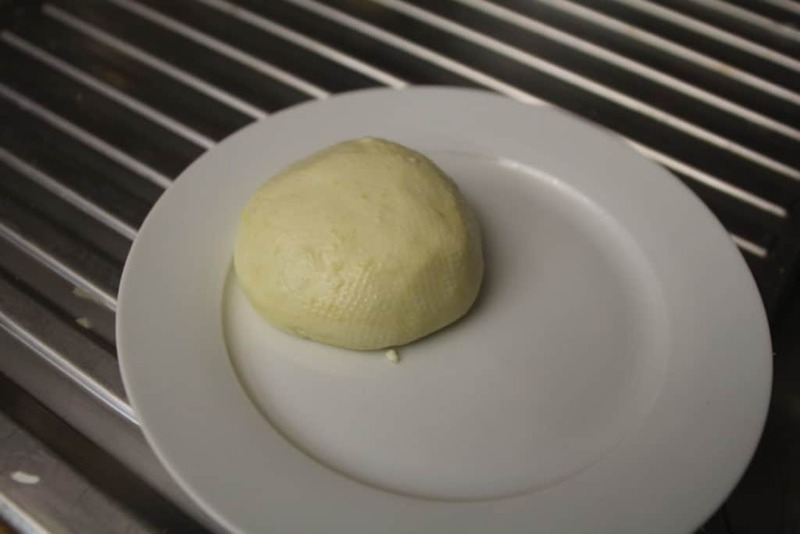 I use Renco rennet, you can buy it from most supermarkets in NZ, it isn’t as strong as fancy cheese making rennet, but it still works a treat for this fresh mozzarella recipe. If you do have fancy cheese making rennet use about half the amount stated in this recipe. 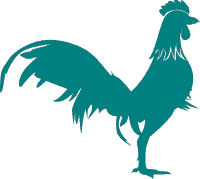 4L milk – either cows or goats works. 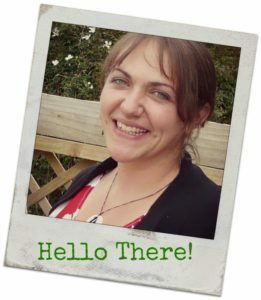 If you are using supermarket milk, the best results are from full fat, non-homogenized milk but most milk will work fine except UHT milk in the tetra-packs. 1 1/2t Fine Table Salt – not chunky sea salt flakes. 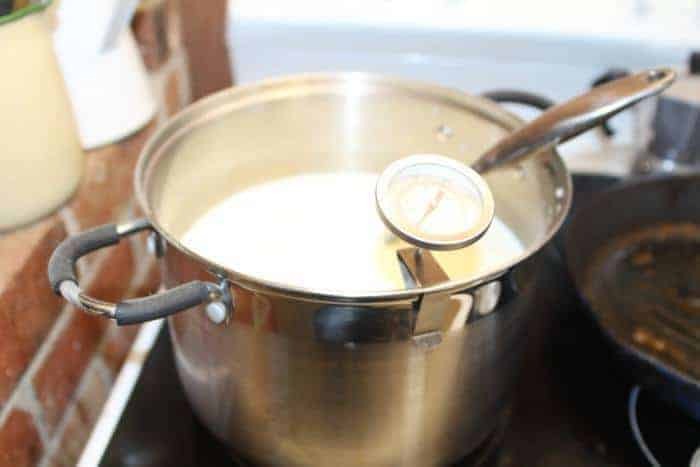 Tip your milk into a large pot and set it on medium heat with the thermometer in it. Take the first 1/2C water and add the citric acid and stir to dissolve. Tip this into your pot of milk and stir it in well. Heat the milk to 32°C (90°F). It might curdle a little, that is fine. 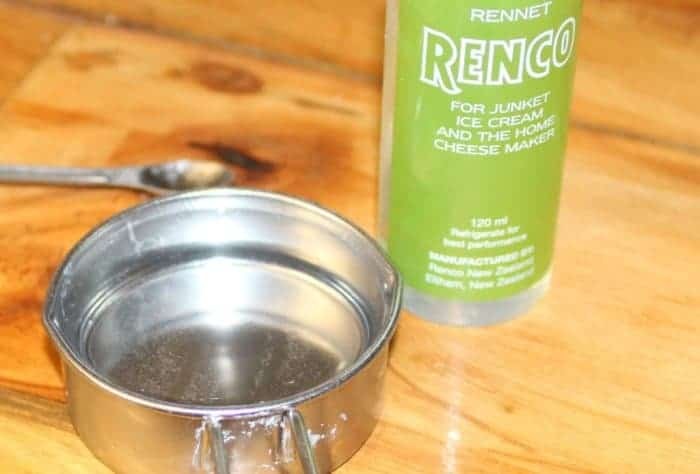 While you are waiting for it to warm add the rennet to the second 1/2C measure of water and stir well. Once the milk is at temperature, remove it from the heat and add the rennet. Stir briskly for 30 seconds in an up-down motion, then let it settle and don’t disturb it again for 10 minutes. 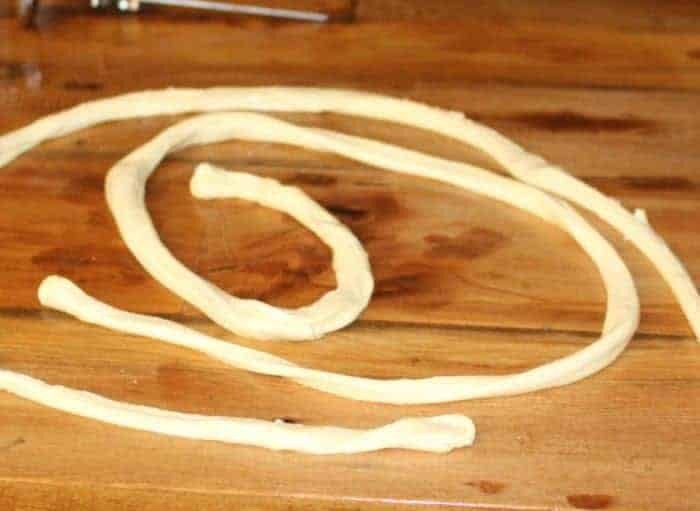 The curds and whey should have split now, and if you cut it with a knife, they should cut cleanly, and the whey beneath should be a clear yellow, if it is milky leave it for 5 more minutes. Cut the curds into 2cm (1 inch) cubes. Make sure your knife reaches all the way to the bottom of the pan. 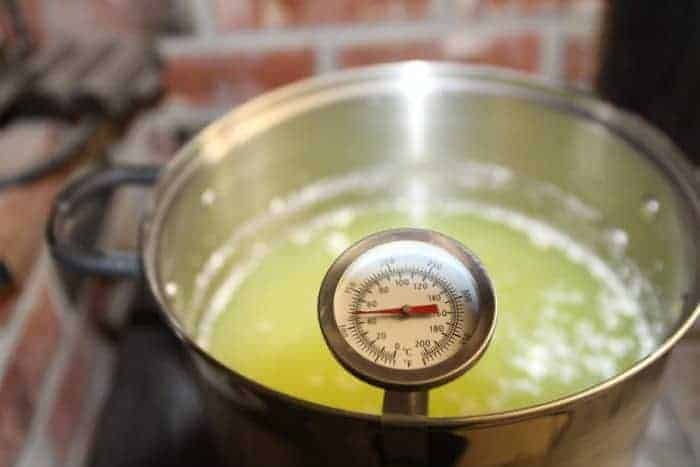 Place the pot back on the stove over medium heat and warm the curds to 40°C (105°F). Stir slowly as the curds warm, but try not to break them up too much. The curds will eventually clump together and separate more completely from the yellow whey. 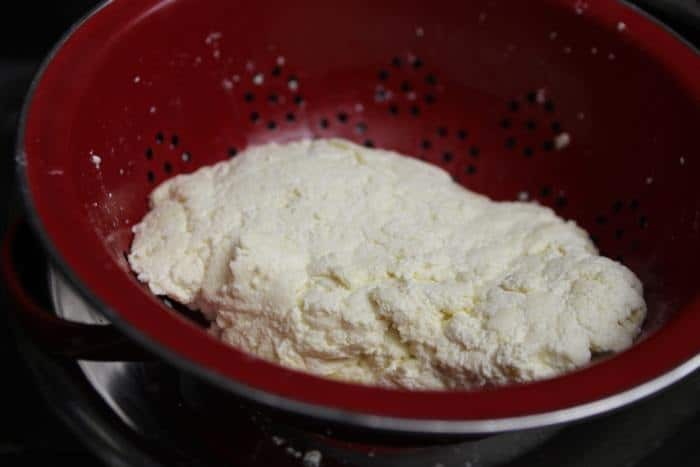 Scoop the curds, which should have the consistency of a thick yogurt, into a colander over a large bowl and let it rest for a minute or two, to drain off more of the whey. Reserve the whey in which to store your mozzarella, or use it to make ricotta first. Option One: Heat the whey to nearly boiling. Pour the curds into a strainer/sieve and nestle them into the pot so the curds are submerged in the hot whey. Let the curds sit for about five minutes. 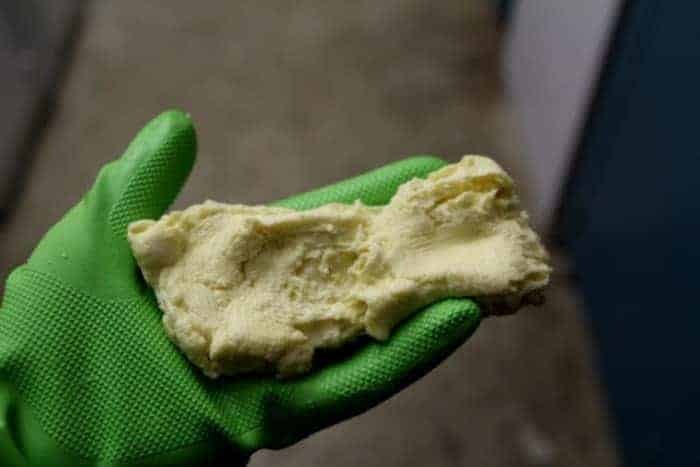 Wearing rubber dishwashing gloves, scoop out the curds and start to stretch and fold the curds, like pulling taffy. If they keep breaking, pop back in the hot whey for a few more minutes and stretch and fold some more. 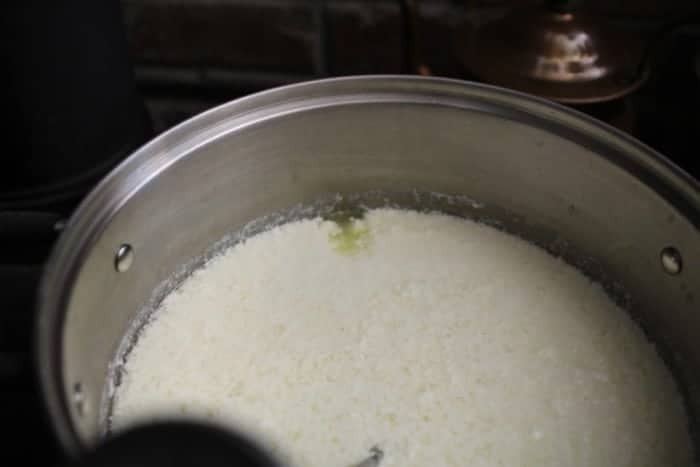 At this stage, the curds should be quite elastic and shiny, fold in about 1-1 1/2 teaspoon of fine salt, and you can form them into small balls for eating warm, or chill in ice water for storage in lightly salted whey. Option Two: Place the curds into a microwaveable bowl. Microwave on high for 1 minute 30 seconds. 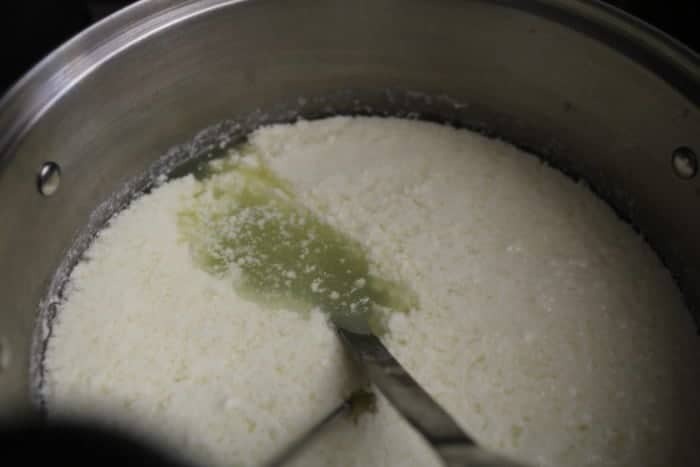 Wear clean dishwashing gloves to stretch and fold the curd mass over and over on itself, to remove excess whey. Microwave again for 30 seconds, and repeat the folding/kneading motion. Repeat a third time, at this stage, the curds should be quite elastic and shiny, fold in about 1-1 1/2 teaspoon of fine salt, and you can form them into small balls for eating warm, or chill in ice water for storage in lightly salted whey. 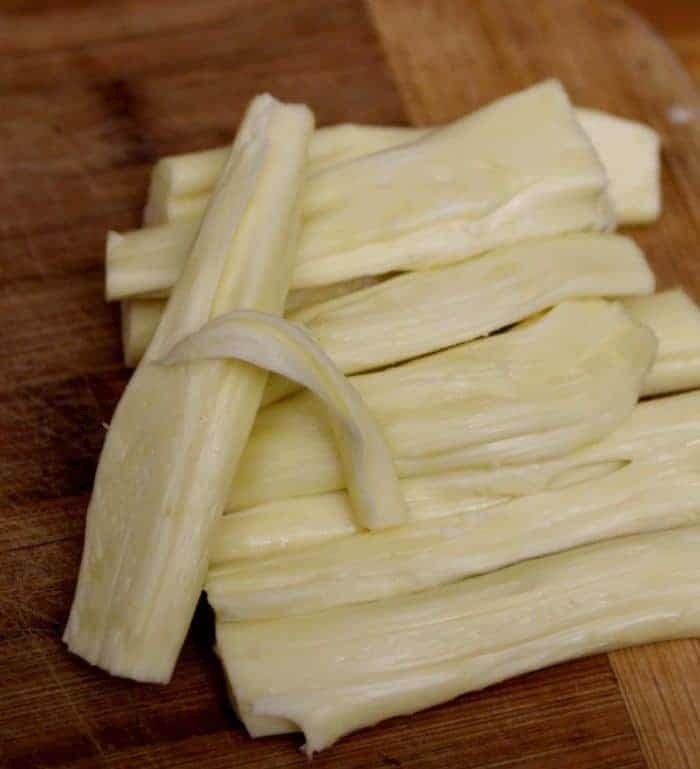 To make American string cheese simply stretch and fold several times in the same direction then stretch and stretch and stretch and let cool for a few minutes before cutting into finger sized sticks. My kids love pulling the strings off and eating them. Who am I kidding? I love pulling the strings off and eating them! Now you can store your fresh mozzarella in a airtight container, in some lightly salted whey or wrap tightly and freeze it. Before you store your cheese in the whey, maybe try making some ricotta with it first? 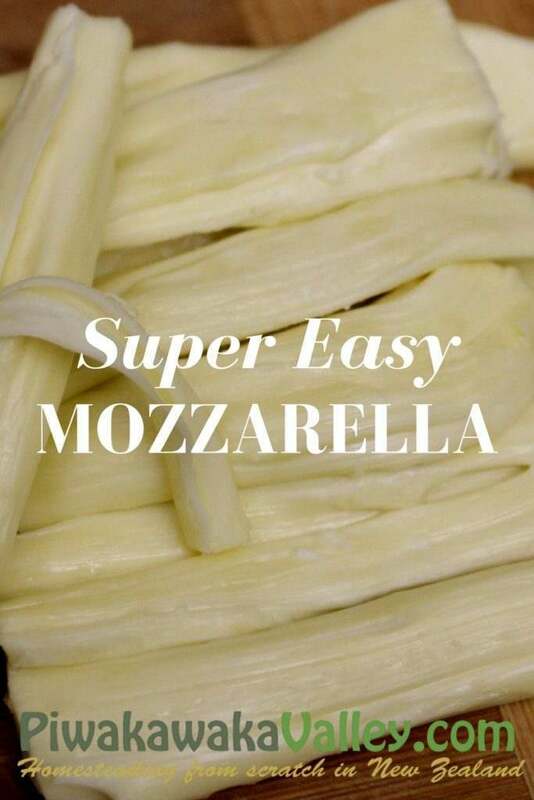 Have you made mozzarella before? Tell me about it in the comments below! I am bookmarking this and going to try it soon. Thanks for sharing this.